Jo Williamson and Gordon Blair. Dozens of golfers have taken part in a charity contest to raise money to help an Angus family’s fight against a rare condition. 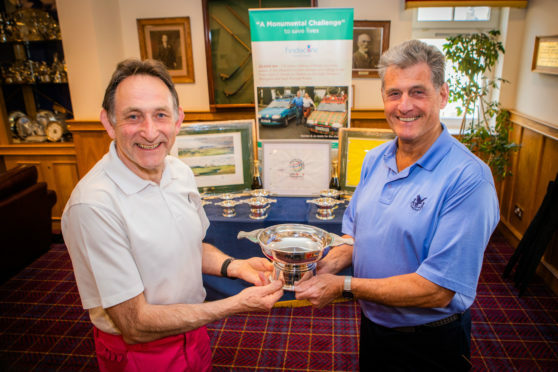 Nineteen teams of four players took to the greens at Blairgowrie Golf Club’s Landsdowne course in aid of Findacure. The charity has provided support to twins Jennie Chinembiri and James Williamson, who discovered they were affected by a rare tumour called phaeochromocytoma after their mother Sue died from the condition. The event was organised by Tayside businessman Gordon Blair, who has previously taken part in a rally from John O’ Groats to Siberia alongside Sue’s husband Jo. The trek, which took place last year, raised thousands for the charity and the group hopes to better this total with the golf event. The fundraising effort has been aided by Blairgowrie Golf Club agreeing to waive their usual £95 per person fee for the rounds, saving the group more than £7,000. In addition to the game, Mr Blair hopes to boost funds with an auction of golfing memorabilia, including a badge signed by players of the 2018 Ryder Cup, a print of Carnoustie Links signed by Paul Lawrie and Jean van de Velde, and a flag from the World Golf Championship signed by Justin Rose. Speaking ahead of the competition, Mr Blair said: “We hope to raise around £8,000. The most significant thing is we will be able to make this money thanks to Blairgowrie Golf Course donating their Landsdowne course free of charge. Normally it is £95 a round. He added that the contest was being run with a “shot gun start”, where teams start at the same time, with each teeing off from a different hole. Mr Blair and two fellow businessmen – Jo Williamson and Brian Meldrum, known collectively as the Highlanders – set off on their 14,000-mile sponsored drive on July 7 and drove as far as Mongolia before turning around again. The friends drove a pair of 22-year-old Ford Fiestas – which had both been painted tartan – across the Mongol rally route without any support or back-up. The drive took them through 16 countries including Bulgaria, Uzbekistan and Kazakhstan, as well as camping 96 hours to wait for a boat to take them from Baku in Azerbaijan to Turkmenistan.